She’s off! Brace yourself for the adventures ahead. If your baby is rocking back and forth on her hands and knees, crawling is around the corner. She just needs to figure out how to pick up one hand and put it in front of her to get going. 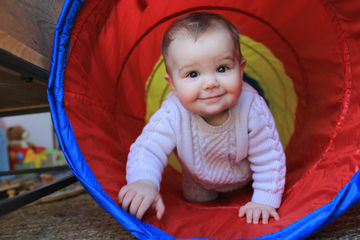 Crawling on all fours is most common, but not all babies start out this way. More and more tots are finding new ways to get around. “Some roll, some commando-crawl on their elbows, some scoot on their bottom, and others bear-crawl on their hands and feet,” says David Hill, M.D., a pediatrician in Wilmington, North Carolina. The new skill is also a good workout: At the same time that your little one is exploring the family room, she’s strengthening the muscles that will help her pull up to standing, cruise holding onto furniture, and eventually walk. RELATED: Is Your Baby an Early Crawler or Walker? What It Means for Her Future! When your baby is rocking on all fours, put your hands behind his feet to create a stable base for pushing off, then tempt him with toys. Place a colorful plaything or interesting item just out of his reach so he’ll want to move toward it. Trust that he’ll get there. He doesn’t need a demonstration. “Crawling is innate,” Dr. Hubbard says. Time to up your safety game! It’s important to triple-check your babyproofing efforts. All those vases and other breakables she’s been eyeing from her play mat will soon be within her grasp! Make sure stairs are securely gated at the top and bottom, outlets are covered, and low cabinets are locked. Move plants off the floor and relocate cleaning products and other hazards to high cabinets. Finally, get down on the floor to spot and remove any small objects she might be able to grab once she’s on the go. Not all babies crawl before walking. Actually, ten percent of babies skip crawling altogether. That’s okay, as long as they hit other motor milestones, such as sitting up, Dr. Hill says. Talk to your pediatrician if your baby only uses one arm or leg to crawl, has a weaker side of his body, or isn’t moving in some way by 10 months.